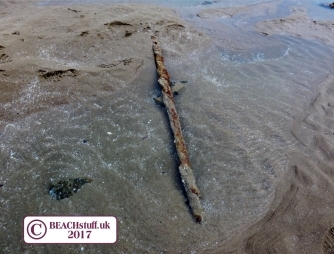 Most metal, after spending some time on a wet, salty beach, will rust. In fact, many pieces of metal will be more rust than metal. It may be impossible ever to work out what they once were. 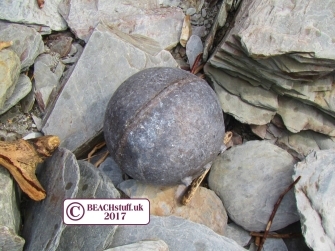 It is also likely that most metal items will be found in situ where they have been dropped on the beach as they are too heavy and non-buoyant to be carried far by the sea. 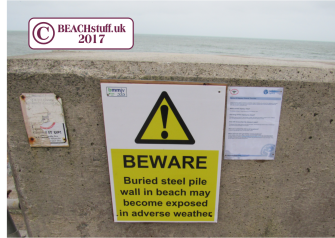 Knowing the history of the beach can help. 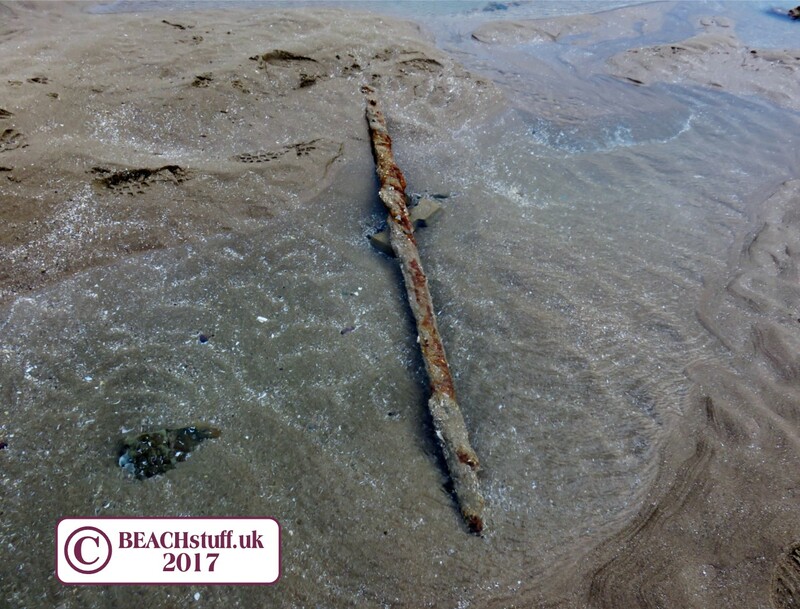 The above piece, about a metre long, was seen on a beach used in the second World War for military training. Perhaps it, along with many other similar pieces of metal on that beach, date from that training. The piece on the left is just about recognisable as a square-headed nail. 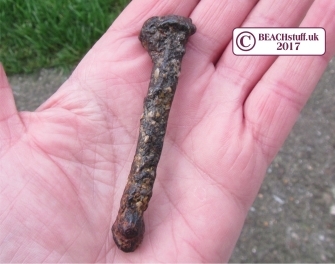 It perhaps came from one of the many shipwrecks in the vicinity and could then date from the 1800s. Hopefuly, this isn't an object that is found too often. This one was seen in an area used for military training exercises. Take cafe with any military metal objects - unexploded bombs (from WW2 manoeuvres) are still found on beaches. Every now and again, you happen upon something on a beach which is astounding - like these remains of a ship which was beached in 1914. By contrast, have a look at the wooden boat beached a century or so earlier. 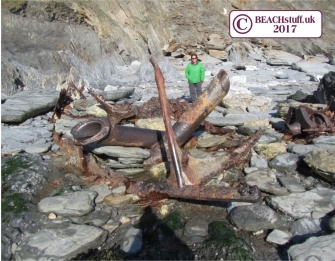 Finding a vintage buoy that is made out of metal is a great thing - but beware, although most buoys are now made out of plastic or rubber, not all metal buoys have any age to them as some are still made out of metal to this day. A whole page of fishing equipment often picked up on beaches can be found here. 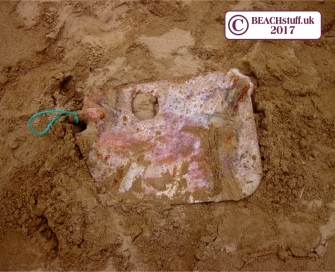 This incredibly heavy piece of metal - about the size of a dustbin lid, could well be an anchor. It was certainly heavy enough to hold a boat. The rise of plastic bottles for drinks and cans with integrated ring pulls, means that there don't seem to be as many ring pulls on the beaches as there used to be. 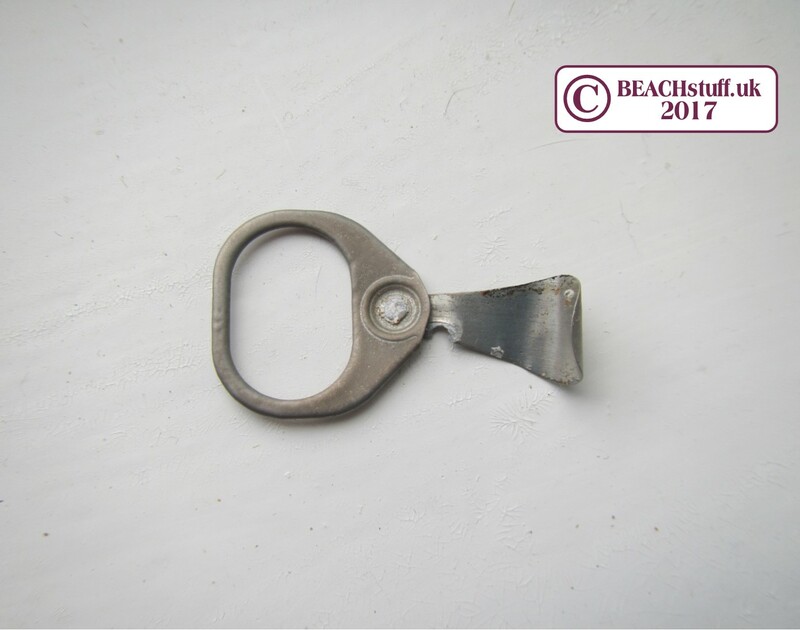 In the UK, the 'detachable' ring pulls were completely replaced on pop cans by ring pulls that stay on the can in 1989. Beer cans followed suit the next year. So if you find a ring pull, it is either getting on for 30 years old or it has travelled from overseas where they are still used on some cans. 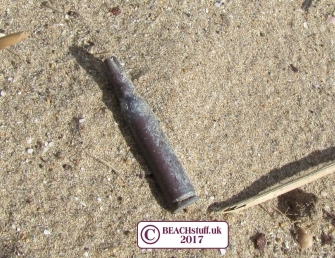 Unspent bullets and unexploded bombs do turn up on our beaches - usually from military training activities - be careful! If it looks like a bomb - or if it looks even slightly like it might look a little bit like a bomb - stay well clear and call the coastguard or the police by dialling 999. Here's a news story about an unexploded bomb that turned up in January 2017.